Osteoporosis, which means “porous bones,” is a progressive bone disease that is characterized by a decrease in bone mass and density which can lead to an increased risk of fracture. 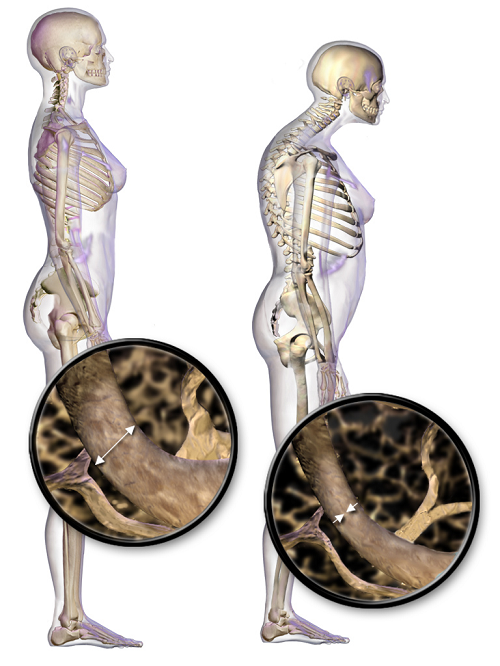 Osteoporosis is often called a “silent disease” because bone loss occurs without symptoms. Many people may not know that they have osteoporosis until their bones become so weak that a sudden strain, bump, or fall causes a fracture or a vertebra to collapse. Gender. Fractures from osteoporosis are about twice as common in women as in men. Age. The older you get, the higher your risk of osteoporosis. Race. Caucasian and Asian women and men have a greater possibility of osteoporosis. Lifestyle. A sedentary lifestyle, low calcium intake, and tobacco use contribute to weak bones. Alcoholism. This is one of the leading factors for osteoporosis in men. Thyroid hormone. Too much thyroid hormone also can cause bone loss. You can’t feel yourself losing bone, but you might feel a spinal fracture – the most common complication from osteoporosis. Acute and back pain are outward signs of such fractures. A bone density test is a detection tool that uses X-rays or sound waves. You’re never too old – or too young – to improve your bone health. There are many things that you can do to keep your bones strong and prevent fractures. A diet rich in calcium and weight-bearing exercise can prevent osteoporosis. Vitamin D is important in your diet as well. It helps your body absorb that calcium. Aim for 200 to 400 international units (IU) daily if you’re 50 and under and 400 to 600 IU daily if you’re over 50. Weight-bearing exercises reduce bone loss and help prevent fractures. Activities such as walking, running, climbing stairs, tennis, and weight lifting can put stress on your bones, this will signal your body that to strengthen your bones. New cells in your body can help strengthen your bones.